Consider his statistics: 22 years of flying in many of Alaska's most demanding regions. Some 17,000 hours at the controls of float, ski, and wheel-equipped single-engine airplanes. No accidents. F. E. Potts flies like a craftsman, respecting his airplanes, his territory, and, above all, common-sense safety measures. To use his own expression, he flies "by the numbers." 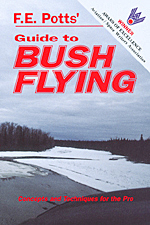 "Despite stories one hears," Potts says, "the most effective way to fly an airplane in the bush is scientifically -- by the numbers. This allows us to obtain maximum performance, though it does require a somewhat higher level of knowledge and skill than normally encountered." Potts is no fence-sitter when expressing his feelings about aviation. "My opinion is that flying in the North is the best in the world," he says matter-of-factly. His reasons are well-justified after his lengthy career as a bush pilot, 17 years of which were spent in one of the most beautiful and rugged parts of Alaska -- the Wrangell Mountains east of McCarthy. "I started a small flying service there with an antique Super Cub I managed to purchase with money my wife and I had saved through careful living -- mostly off the land." People who wanted to go into that area for mineral exploration, or to hunt big game, composed his principal market. But civilization finally caught up with him when a road was built into the area and it was turned into a national park, so in 1984 he decided to retire from the commercial flying business (FAR Part 135) and devote himself more to writing. He sold his property to a group of investors headed by his very first customer in Alaska. "He and a friend went out and got themselves a record-book ram. They remained customers for years." In the spring of 1985 he moved his base of operations to Arizona, where he now has a home and hangar on a private airstrip in the Sonoran Desert. But that doesn't keep him from the North, which he visits regularly, either in his Cessna TU206G or his Beechcraft B36TC, depending on the mission. Potts and his first wife, Dolly, settled in Alaska in 1992. They were attracted to the state through natural curiosity and impulse. "I was 28 then. I've been a licensed pilot since I was 17, so it was obvious what would be my new trade." To satisfy this curiosity they traveled about halfway around the world via commercial airlines and touched down in Anchorage. "I have lived and traveled extensively in North Africa, the Middle East, and India," Potts said. "In 1962 Dolly and I happened to be somewhere in backcountry Jordan, traveling among the Bedouin. One afternoon, with the temperature well above 100 degrees F, we were sitting under the awning of the chief's tent awaiting the cool of the evening. While passing time and drinking coffee, I was translating the text of a gun catalog from English into Arabic for our companions -- a gift I had brought them, but not previously read. Guns were one of their primary interests. "As I was turning the pages, and answering their questions while we discussed the relative advantages and disadvantages of various guns and calibers, I came to a picture of two hunters in Alaska. They were somewhere on the Kenai Peninsula, posing with their moose in the gently falling snow, rifles in hand, the dim outline of spruce trees barely visible behind them. To one side lay their packboards, waiting, as did a meatsaw resting on top of one of their packs. It was obvious they would be eating well that winter. "I looked up from that picture of virgin wilderness, then out across the barren desert, through a cloud of blowing sand and dust, flies shimmering in the heat waves. My gaze drifted across the scene until it reached my wife. She nodded, saying nothing. "So, as though nothing momentous had happened, I finished the translation, allowed our visit to come to its courteous end, and about a week later we were on our way to Anchorage. We arrived in Alaska with the clothes on our backs, my cello -- hardly the best tool for earning a living in Alaska -- and $18." They spent their first winter in a tent in the Cooper Landing area. Later they moved to Chitina, and after two years in Alaska they settled in the Wrangell Mountains. By 1971 he was one of the first 13 pilots in Alaska to have FAR Part 135 single-engine instrument authorization to carry passengers and cargo for hire. He used a Cessna 180 for instrument flying, and also had IFR instrumentation in a Super Cub because of a few special jobs it would permit him to do that could not be done otherwise. In 1972, Potts was offered a contract to fly for an expedition in East Africa with archaeologist L. S. B. Leakey, who was searching for traces of early man. The expedition was funded by the L. S. B. Leakey Foundation and the Guggenheim Foundation. "They couldn't find anyone in East Africa who could fly the terrain Leakey needed to operate in using fixed-wing equipment. And the cost of helicopter support would take them over budget." Foundation photographs and maps indicated that, even at the altitude where they would be operating, it would be easy flying in comparison to much of the terrain Potts operated off of in Alaska. A contract was signed, and Potts and his wife left for New Orleans in their C-180, which was to be shipped from there to Nairobi by sea. Their plan was to accompany it, enjoying a rare vacation in the process. But while they were enroute, Dr. Leakey suffered a fatal heart attack. So the Leakey Foundation instructed them to proceed to their headquarters in Los Angeles. Without its leader, the expedition was in serious trouble, not only from the loss of knowledge and skill, but from negative publicity as well -- always important to funding foundations. "Along with many Northerners, I share the characteristics needed for developing new frontiers: a love of adventure and exploration, a desire to build, to achieve, to cope with difficult problems and come up with pragmatic solutions. For the truth of the matter is, the North is not just a place to live and work, but a state of mind."